To get to the Central Museum of the Great Patriotic War 1941 - 1945, Park Pobedy in Moscow you will find it on the road called Kutuzovsky Ave in the west of the city. The nearest metro station is Park Pobedy. The tanks are kept in an outdoor section to the left of the main museum building, as you look at the entrance. Follow the signs to the 'War Weaponary and Fortification' exhibit'. There are no tanks in the main museum. 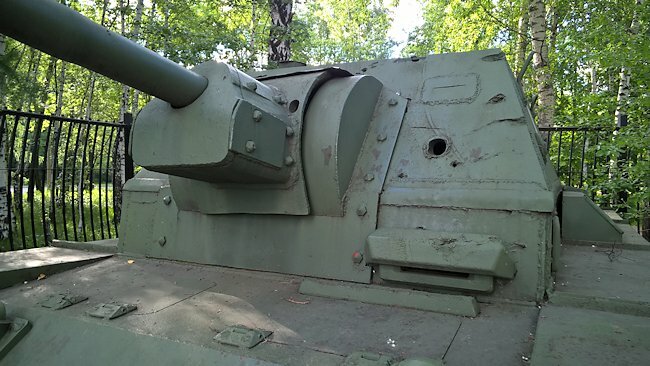 The SU-76i self propelled gun was armed with a 76.2mm S1 gun which was fitted in a fully closed armoured casement unlike the SU-76 SPG which did not have a roof. The crew were protected by 35 mm thick armour plate at the front, 25 mm at the sides and 15 mm thick armour at the rear. This was thicker than the thin armour on the SU-76. It was powered by a 12-cylinder Maybach HL 120 TRM gasoline petrol engine that produced 396hp. It had a top rod speed of 40 km/h (25 mph) and a cross country speed of 20 km/h (12 mph) with an operational range of about 165 km (103 miles). It needed a crew of five: commander, driver, radio operator, gunner and loader. This SU-76i driver could only see straight ahead and to his left. Notice the vision slit above the covered pistol hole on the left side of the armoured casement. It is missing the additional gun shield and dust cover. 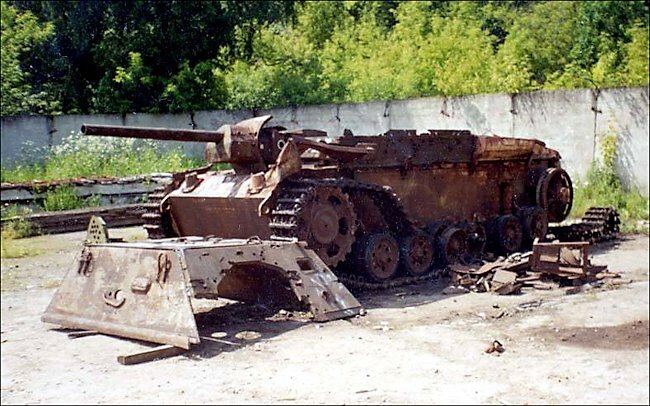 The Soviet red army captured a number of German panzer III and StuG III tank chassis during 1941 and 1942 battles on the Eastern front. A decision was made to fit them with 76.2mm S1 guns which was a shorter version of the 76.2mm Red Army divisional field gun M1942 ZiS-3, The letters 'ZiS' was a factory designation. The abbreviation stood for Zavod imeni Stalina ("factory named after Stalin"), the honorific title of Artillery Factory No. 92, which first constructed this gun. The gun could fire high explosive HE shells as well as armour piercing rounds. Firing as an artillery gun using HE shells it had a maximum range of 13.29 km (8.25 miles). Its Armour piercing rounds could penetrate 75mm of armour plate at a distance of 500m and 82 mm at 100m range when the armour was at a 90 degree angle. It could not penetrate the front armour of a tiger tank. but could knock out a Panzer III or IV tank. 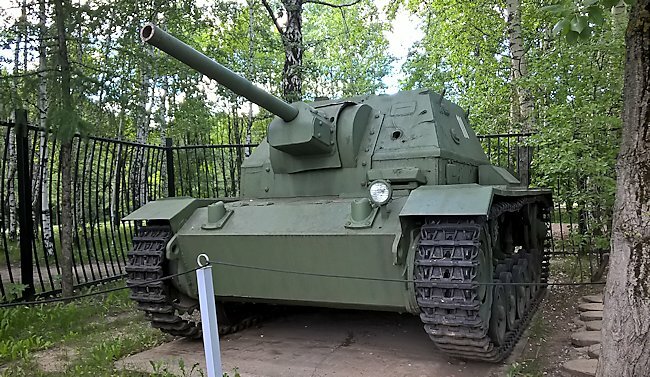 This SU-76i Soviet SPG was armed with a 76.2mm anti-tank gun. The fully enclosed casement around the gun gave better protection for the crew from the weather and from small arms fire, motars, grenades and shrapnel. The upper section was welded together and slightly angled. Hinged pistol holes with an armoured cover were inserted in the upper slab sided armour plate to enable the crew to fire there hand held weapons and enemy infantry that were getting too close. A vision slit was fitted above the pistol hole. 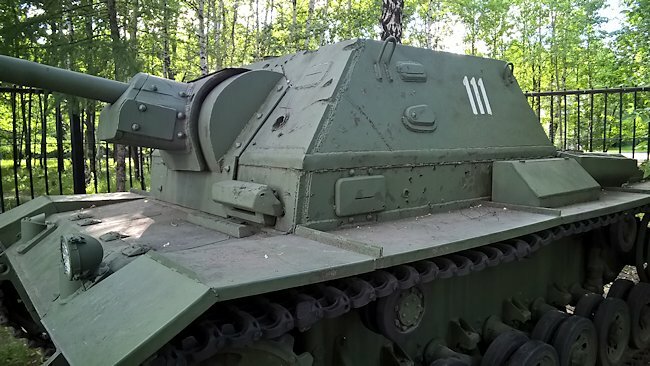 The hull mounted machine gun found on the Panzer III tank was removed on the SU-76i SPG. The driver sat on the left and had limited vision. He could only see directly ahead and to his left through and armoured vision slit. By November 1943 181 Panzer III tanks and StuG III assault guns had been converted to SU-76i SPGs (20 were command vehicles). They were used operationally on the Eastern Front up until 1944 where they were withdrawn from front line service and those that remained sent to tank training schools. Where can I find other preserved Soviet SU-76M and SU-76i SPGs?